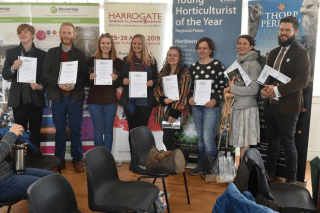 Emily Marston (RHS Gardens Harlow Carr) has won the CIH Northern Regional Final for the second year in succession and we now look forward to watching her take on the other seven competitors from across the UK and Ireland at the Royal Botanic Gardens Kew on May 11th. During the introduction to the audience by the eight competitors, Emily announced that she has been accepted onto the Level 3/4 studentship at RHS Gardens Wisley, starting later this year. Elizabeth Mooney, who came a close second, also announced that she has been accepted onto the same course! Tara Mason (open heat second place) 8th. Regionally, we have two sponsors, without whom the Regional competition would not happen. The North of England Horticultural Society (NEHS) (www.flowershow.org.uk) generously provide us with a sum of money each year which allows us to give worthy prizes at the first two stages of the competition. In addition, we are provided with a sun of money each year from Stockbridge Technology Centre (www.stockbridgetechnology.co.uk) near Selby that allows us to provide each of the eight Regional Finalists with a copy of the Collins Guide to Pests, Diseases and Disorders of Garden Plants – these are presented at the Bruce Rigby Memorial prize at our Regional Final. In addition, nationally, Bulldog Tools (www.bulldogtools.co.uk) provide a spade and fork set for each of the eight Regional Final Winners.